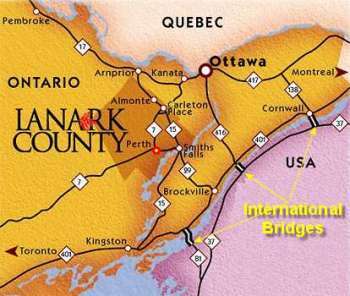 Perth is located in Lanark County halfway between Ottawa (80 kms) and Kingston (86 kms). From Ottawa, take Highway 7 West. From Kingston take Perth Rd/Route 10. From Toronto take 401 East to Belleville, go north on Hwy 37 to Hwy 7 and drive East. you're here in 1 hour. click on the banner below for real-time arrival and departure info. By Boat: You can also reach Perth via the Rideau-Tay Canal System. The Tay River branches from the Rideau Canal between Smiths Falls and Newboro. There are two locks (#33 Lower Beveridges, #34 Upper Beveridges) which bypass the river to join Perth to the main canal. Parks Canada operates the canal seasonally, late May to Thanksgiving. Commuter Bus: Classic Alliance 613-253-3443 offesr a commuter bus service from Perth to Ottawa during the work week. 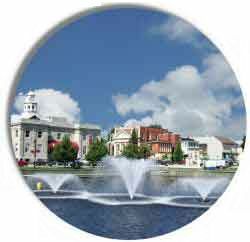 By Train: The closest rail station is in Smiths Falls, on the Toronto-Brockville-Ottawa VIA "Corridor" service.